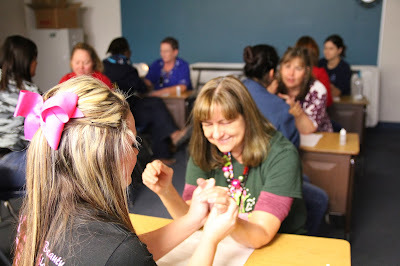 Mrs. Vanessa Tindall's Cosmetology Students brought the "Spa to School" when they spent the day at Huntsville Elementary School offering Holiday Cheer...in the form of complimentary hand massage and paraffin wax treatments. Miss Ebhamen enjoys Carolina's massage. They created stations out of desks, dimmed the lights, played soothing music and turned on the Scentsy to bring as much of the full experience to their clients. Teachers and Staff came during conference times- here we have a full house. Mrs. Bass smiles as Cosmo Two student Tanna works her magic. Cosmo Two student Shiann and Kindergarten teacher Mrs. Smith share a conversation. To the uninitiated, the paraffin wax process may look a little odd but it sure does work! The right scent, the right music & the right lighting set the right mood. HES Principal Koren Nicks asked Mrs. Tindall if her students would be available to visit, and Mrs. Tindall jumped at the chance to share her students' talents, spread some cheer (and get some extra practice in, too.) The Cosmetology Salon (located at the High School) will be back open at the beginning of the year on Thursdays from 1:30 p.m. - 4:30p.m., and at 8:30 p.m. by appointment. They also accept appointments for 7:45a.m. on Fridays. Call them at 936-435-6134 for more information. Cosmo Two students Rebecca and Jackie take a break. Assistant Principal Turner says- "Thanks, I needed that!" We proudly present you Cosmetology Two in all their full color GIF-dom. At the end of the day, things got a little silly-is Cosmo 2 on a roller coaster or are they doing the wave!? With Google's recent photo editing upgrade in Google+ called Auto Awesome, the program will automatically create these for you when you upload a series of similar photos. You can read all about Auto Awesome Features here. These above are made up of 15-20 images. Everyone in the district has access to Google+, so you can do these, too. Fun? Absolutely. Educational? You tell us- you or your students can get creative and share. You can read more about these and other photo editing features on the Google blog here and on technology website, The Verge. The Auto Awesome features are definitely amazing, and we'll introduce you to more throughout posts in the new year. Bullying- Not in Our House! It's Beginning to Sound a Lot Like Christmas!